Launching a new marketing campaign is always a hit or miss affair. For some entrepreneurs, this doesn’t come as a surprise – the amount of research and preparation that went into the campaign can only increase your chances of success, not guarantee it. There are some entrepreneurs that fail to grasp the situation in its entirety, leaving much of their campaign to chance and strokes of luck which can lead to catastrophic consequences and spiral out of control fast. 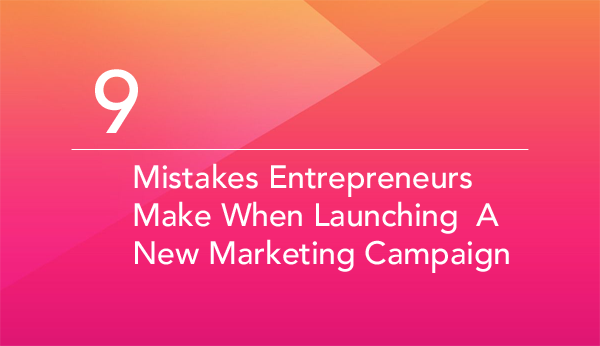 What are some of the most common mistakes that entrepreneurs make when preparing and launching a new marketing campaign for their company? Pleasing everyone is impossible. There are so many factors to consider when choosing your target demographic that you will often neglect the message of your brand just to cater to the lowest common denominator. This is the wrong approach to setting up a marketing campaign because your goal isn’t to please everyone – you want to please your current customer base and attract more people just like them. Aiming for a wide audience with huge differences in taste, expectations and life habits can lead in a murky, uninspired and bland campaign that everyone will forget as soon as it’s over. Worst of all, your budget will be spent and you will lose your window of opportunity to reach new audiences. Start with a smaller demographic focusing on their age, occupations and spending habits. It will give your marketing team a much better sense of orientation when conducting research and forming marketing content for later use. Starting a marketing campaign based on a whim will result in a disaster right from the get-go. You need to create a clear and focused marketing roadmap before heading into the campaign. What are the milestones and numbers you are trying to achieve? What are the results you are trying to get months down the line following the campaign? Creating content based on someone’s passing idea and then throwing things to the wall until something sticks is not the way business is conducted in today’s market. Talk to your marketing staff about a clear vision of what the marketing campaign should look like, what budget should you allocate for it and what ROI you can expect in the following months. Creating wrong content for your audience can be amended by quickly creating and replacing old content with suitable one. But what happens when you create content for the wrong audience and miss your target demographic completely? Conducting customer interviews and getting their testimonials is a good way to secure your marketing efforts. Releasing small samples of your marketing content to a group of volunteers and analyzing their reactions is a good way of making sure that your content doesn’t miss the mark. Always double check if the content you are creating is suitable for your audience and what kind of an effect it has on those who are not your target demo. Sometimes the results can be negative, leading to controversy and negative word of mouth. Relying on data can sometimes be detrimental for your marketing campaign. Consult your marketing team and get a psychologist on board and talk about your brand awareness and how you can push your product to a wider audience. Sometimes data will tell you one thing while basic human logic will tell another story. It comes down to you and your team to decide what you will rely on more, but finding a healthy balance of both is always a good idea. Using only one over the other will often result in a forgettable campaign that people will gloss over as soon as they see what you have in store. Human logic is a fickle thing, so make sure that you exploit it to the best of your knowledge. Creating too much content can lead to mass confusion and oversaturation. Creating a campaign that focuses on a smaller number of repeated ads, catch phrases and visual elements is a good way to get brand recognition – just ask Coca-Cola or Nike! Those brands rely on their signature colors, logos and visions to sell products and spread their messages. If you need help creating quality content and delivering it to your audiences, you can check out a research paper help and see if any professional writers are willing to give you a hand. It’s always smarter to create less content but put more effort into it than mass produce content that people will get sick of very quickly. Competition will always exist, no matter the niche you are working in. It’s important to recognize your competition as healthy and not detrimental to your own efforts. You can learn a lot from your competitors by avoiding the mistakes they make and using the positives in their campaigns. Following the marketing campaigns of your competition should be a priority for a small part of your marketing team – a small moment of brilliance can completely shift the focus of your own campaign. Don’t stress over the competitions revenues, success or looming dominance. Working under such circumstances will only lead to a drop in quality and productivity in your own offices. Your marketing content should be based on whatever the market dictates. If people like seeing babies with superpowers on their ads, then that’s what you should go for. Ignoring the needs of the market will result in your brand being pushed aside by smaller and more adaptive brands. Don’t be stubborn when it comes to listening to the market – you are working towards making revenue and reaching new audiences. Pushing your own agenda without thinking twice will only result in a dry and corporate marketing content that no one likes. Once your content becomes viral, you will see a lot of feedback and comments coming from the public. Just like before, listening to what your own customers are saying is essential in building brand awareness and loyalty. Sometimes even the simplest changes in color or logo design can have a huge impact on the way your products are perceived. Give your customers a voice and set up a feedback email address that people can use. People like to be heard, and applying some of their suggestions can potentially lead to huge increases in brand awareness and a boost in public approval. The worst mistake that entrepreneurs make when creating marketing campaigns is not learning from their own missteps and lapses in judgment. Creating an ad campaign and basing it on data and principles you know are wrong is just asking for trouble. Make sure that both you and your team learn from mistakes that you make down the line – and there will be plenty, it’s just the way things work. No one has ever created dozens of campaigns without a single mistake, meaning that becoming a professional marketing content creator is all about learning by yourself, from yourself and others. While entrepreneurs often find marketing campaigns stressful and risky for their businesses, they often come out successfully on the other side and create great brand awareness. It’s more about avoiding industry tropes and sure pitfalls that you know won’t work no matter the effort you put into them. Give yourself and your team plenty of time to brainstorm and come up with unique and approachable ideas to push your brand awareness forward. Ashley Kornee is a blogger and freelance writer. She always tries to write about ordinary things in a creative way. Her favorite topics to write about are marketing, business, entrepreneurship.You can find her on Facebook and Twitter.